This is kind of cool...subscribe to TFH magazine's digital version for the iPad for just $1, and be entered to win an iPad. Not sure why you'd need an iPad if you were subscribing to the digital version in the first place...but you can subscribe to the regular print version for $28 and be entered to win that way as well. The video of the digital version above looks gorgeous, highlighting several planted aquariums, and the digital version comes with archives dating back to 2007. What better way to use an iPad than look at gorgeous pictures of aquascapes? Anyone have a subscription to TFH? Looks pretty aquascaper-friendly! Do you have a list for the promotion as it does not appear to be on TFH website. thank you. I am a subscriber of the TFH digital. Pretty good to read it on a 24" screen. Takashi Amano publish an article in every issue with shocking quality photos really. That is what you see on the video. Very minor aquascaping info in the rest of the magazine, but the magazine itself is pretty enjoyable. 1 buck for a year subscription of TFH digital is nothing! i would not miss it. TFH has articles every month from no less a luminary than T. Amano himself. The dude. 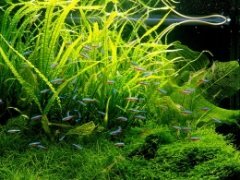 The japanese superstar of the planted tank scene, and the "nature aquarium" style. His article is always followed up by an advertisement from his company. It makes me think they have a deal. Yo, famous dude, write for us, and we'll give you an advertisement, as partial payment. Apparently his articles are translated from Japanese into English by a very very good translator. They are so well written, I learn so much every month just from that. The whole thing is fabulous. They have the best aquatic-hobbyist writers in the world. Will be looking at this as soon as my ipad arrives this week!